Each year, the Council on State Taxation (COST) examines the share of U.S. state and local taxes that are borne by businesses. This year, they estimate that number to be 45.2 percent. The distinction between individual and business taxpayers is important when it comes to crafting smart sales tax policy. Sales taxes shouldn’t be levied on business inputs, so understanding the proportion of them borne by businesses is a good place to start when lawmakers seek to reform their tax codes. I’ll touch more on this shortly. COST estimates that businesses paid $649 billion in state-local taxes in the 2012 fiscal year, which is a 3.9 percent increase from 2011 (note that overall tax collections increased, as well). The largest chunk of business taxes come in the form of property taxes (35.3 percent of total), as you can see from the figure below. Sales taxes ring in second (21.2 percent), followed by excise, utility, and insurance taxes (12.3 percent). What’s interesting is that while corporate income taxes are the most recognizable type of business tax, collections amount to only 7.6 percent of total taxes on business. This is due to a number of factors: the share of businesses organized as traditional C-corporations is shrinking over time, states like to offer tax incentive packages that reduce firms’ tax liability, and an increasing number of states are moving more towards sales-only factor apportionment as a means to entice businesses to come do business within their borders. All of this has resulted in shrinking state and local corporate income tax revenues. In fact, in the 2010 fiscal year, corporate income taxes made up only 3 percent of total state-local tax revenues in the U.S. 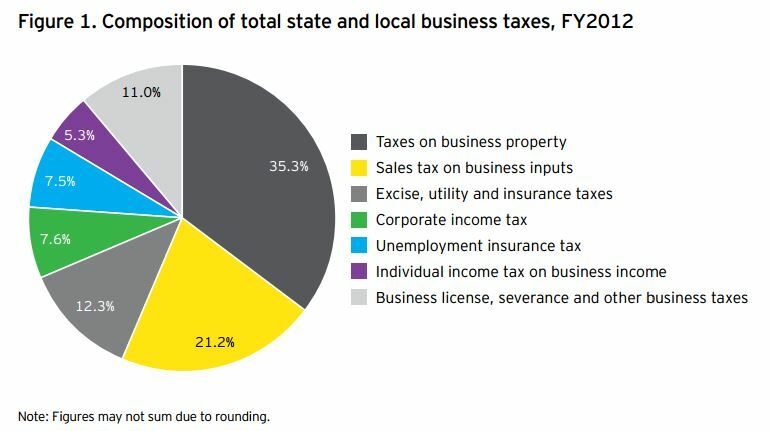 I want to draw attention to the large yellow wedge in the pie chart above—sales tax on business inputs. In a perfect tax world, this sliver wouldn’t exist because the sales tax would only be levied on final consumer purchases. It would exempt all business inputs because that leads to something economists call “tax pyramiding.” It occurs when taxes pile up on top of one another as an item is taxed repeatedly during the production process (see here for a good discussion and example). The COST study makes it clear that state sales tax systems are far from perfect in this regard. When government benefits received by businesses are compared to taxes paid, businesses pay for what they get—and then some (the exact taxes-to-benefits ratio depending on your assumptions regarding who benefits from education spending). The ratio of taxes paid to benefits received ranges from $3.21 in collected taxes to every $1 in benefits (if we assume all benefits from education go to individuals, not businesses) to $1.20 in taxes to every $1 in benefits received (if we assume that half of the benefits from education accrue to businesses). Approximately 5.3 percent of business taxes are collected via the individual income tax (on pass-through entities). This number grew by nearly 14 percent between 2011 and 2012. Most states saw an increase in level of business taxes collected. Only two had a decrease (New Hampshire and California) and three remained nearly flat (Delaware, New Jersey, and Rhode Island).